The first Cambodia golf course opened in December 1996. The Cambodia Golf & Country Club is located 33 kilometers, west of Phnom Penh. 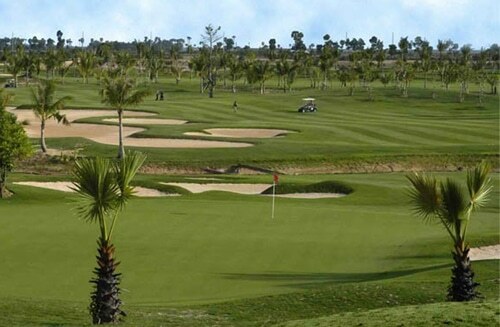 Set among 120 acres the 7000 plus yard Cambodia golf course was designed by Japanese and Taiwanese and lined by sugar palm trees, native fruit, and evergreen plants, flowers and rocks. Large and distant mountains in the background make for a relaxed day out golfing in Phnom Penh. The front nine is rather flat, with wide fairways and many sand traps is surrounded by rice farms. The greens are enormous and 3-putting is relatively common. The back nine is a bit hillier and more challenging. Elevation changes, long fairways, small greens and numerous ponds and bunkers characterize most of the holes. 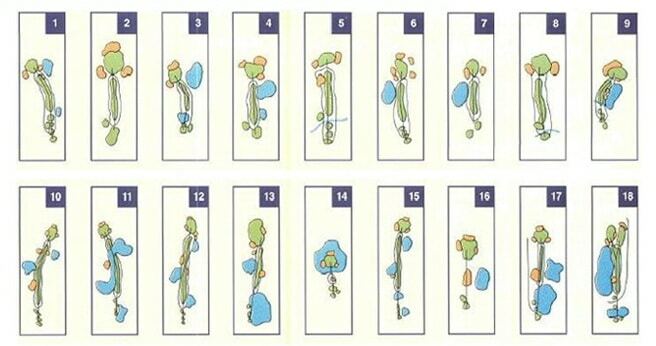 Club selection is critical to reaching the greens in regulation. The Cambodia Golf and Country Club is a fair test of golf and rewards good play. The Cambodia Golf & Country Club has a lovely French style clubhouse with a restaurant as well as areas for other sports such as swimming and tennis. All in all, there are better Phom Penh golf courses, though Cambodia offers a nice day out golfing in Phnom Penh. Have you played golf at the Cambodia Golf & Country Club and took some nice photos that you would like to share with other golfers? Send them to us and we may upload them here. Thank you in advance!